People gather near an ambuance as they attend funeral services for Kulsoom Sharif, the wife of former Prime Minister Nawaz Sharif who was temporarily released from prison, in Lahore, Pakistan September 14, 2018. Pakistan’s former First Lady Begum Kulsoom Nawaz was laid to rest in northeastern Lahore city on Friday. Thousands thronged the Jati Umra -- residence of Sharif family on the eastern outskirt of Lahore -- to attend the funeral prayer led by eminent religious scholar Maulana Tariq Jameel. 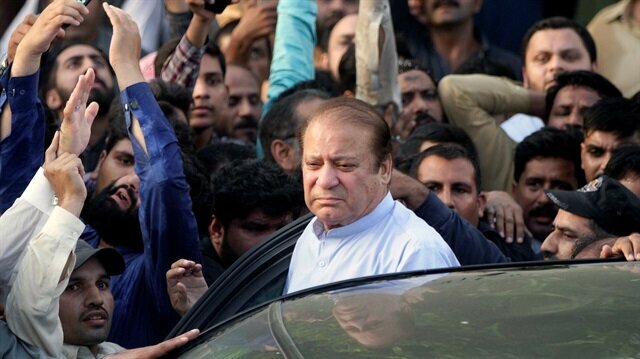 Kulsoom’s widower and jailed ex-premier Nawaz Sharif, who was released on a parole together with his daughter and political heir Maryam Nawaz on Wednesday, also attended the funeral marking an end to the couple’s 47-year marital association. Live footage aired on local TV channels showed a van, weak and weather-beaten Nawaz Sharif who has served as premier for three terms, coming to attend the funeral surrounded by his family members, and plain-clothed security personnel. Former Prime Minister of Pakistan, Nawaz Sharif, attended his wife's funeral on Friday (September 14) in Lahore. Pakistani authorities on Wednesday temporarily released former Prime Minister Nawaz Sharif, his daughter and son-in-law to attend funeral services for former First Lady Begum Kulsoom Nawaz, who died of cancer the day before in London. Others who attended the funeral included, Senate Chairman Sadiq Sanjrani, National Assembly Speaker Asad Qaiser, Opposition leader and Nawaz Sharif’s younger brother Shehbaz Sharif, former President Mamnoon Hussain, Punjab Governor Chaudhry Mohammad Sarwar, former Prime Minister Raja Pervez Ashraf, and leaders of the ruling Pakistan Tehreek-i-Insaf (PTI), center-left Pakistan People’s Party (PPP), Jamat-e-Islami, Jamiat Ulema Islam, and other political and religious parties. Sharif, his daughter Maryam, and son-in-law Mohammad Safdar are currently serving jail terms in a corruption case. However, Sharif’s supporters see a judiciary-army nexus behind their conviction. Kulsoom, a PhD in Urdu literature, lost her protracted battle against cancer in a London hospital on Wednesday. Her health deteriorated rapidly after her initial diagnosis with lymphoma in June 2017. Despite not being able to campaign, she still won the by-election on a National Assembly seat in September 2017 from Lahore, following disqualification of Sharif in whistleblower Panama papers scandal by the country’s top court. She was known as a “brave woman” for her daring struggle for Sharif’s release following dismissal of his elected government by the then army chief Gen. Pervez Musharraf in 1999. However, she generally maintained a low public profile when Sharif remained in power.